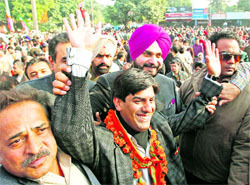 Perceiving today to be the last day of campaigning before the municipal corporation (MC) poll on December 17, political parties added to the confusion today by pushing in star campaigners like MP and former cricketer Navjot Singh Sidhu and Bollywood actor Shakti Kapoor. 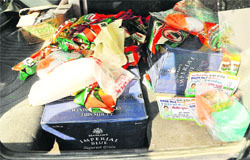 The UT police today intercepted a Maruti van at Sector 36 with five cartons of ‘Imperial Blue’ whiskey, along with banners, flags and stickers of the Congress candidate from ward 4.
Who cares about High court orders? The three top government hospitals in the city, the PGI, the Government Medical College and Hospital (GMCH), Sector 32, and the Government Multi-Speciality Hospital (GMSH), Sector 16, are facing acute shortage of doctors, with over 17 per cent of sanctioned posts lying vacant at various levels. 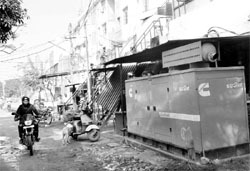 In the first major incident of violence in connection with the forthcoming MC elections, supporters of the BJP and the Congress reportedly clashed at the main market of Sector 20, here today. Panjab University (PU) has made a mockery of the noble exercise of convocation this year, going by the fact that all 690 toppers will be ‘honoured’ in a brief ceremony, giving 15 seconds to each achiever, after the university concludes its long-drawn programme of honouring four persons with honorary degrees and then halting the programme to drop them off at the airport. War of words continued with SAD-BJP candidate from ward No. 15 Harjinder Kaur holding a press conference against her opponent Chander Mukhi Sharma of the Congress here today. With just a day left for the municipal corporation elections, candidates made last-ditch efforts to muster support by holding “nukkad” meetings and undertaking hectic campaigning. It was a day of entertainment for city voters who witnessed interesting sessions from BJP MP Navjot Singh Sidhu and Bollywood baddie Shakti Kapoor. The Chandigarh Jan Manch came out with their manifesto just two days before the city goes to the polls for the municipal corporation elections. In yet another jolt to the UT administration’s efforts to preserve city’s heritage, a New York-based auction house sold city’s heritage items yesterday. All complaints with regard to an act of cruelty towards animals in the city can now be submitted in writing at the collection window of the Chandigarh Police Headquarters in Sector 9 every Wednesday from 8 am to 1 pm. 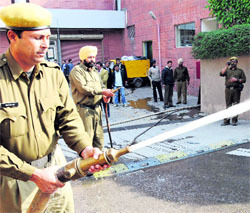 Minor fire safety discrepancies were noticed by the fire department during a special inspection at Hotel Taj here today. During the inspection, a fire and emergency team inspected all floors of the hotel along with the basement, where smoke outlets were not available. The hotel management was asked to strengthen the fire protection of the electrical panel. The Bar Council of the Punjab and Haryana High Court suspended Mohali-based lawyer Jagtar Singh’s licence for a period of one year here today. In order to create awareness among consumers about their rights, National Consumer Day was observed at Government Secondary School, Balongi, by the Consumer Protection and Awareness Council today. High drama prevailed at PUDA’s office in Sector 62 here when landowners, whose land is being acquired for IT City and multi-storeyed towers in Sector 88, barged into the office of Greater Mohali Area Development Authority (GMADA) while raising slogans against the Punjab government for giving land compensation much less than the market value of their land. A woman and her one-and-a-half-year-old daughter received serious burn injuries when their hut caught fire at Madawala village in Pinjore this morning. Around 75 new recruits will soon be joining the local police after completing their initial training. These new recruits will help the local police in keeping a strict vigil in the district. A multi-speciality hospital will come up on a site measuring more than 5 acres in Sector 62. A physiotherapy unit has started functioning from the Civil Hospital in Phase VI here. The unit started functioning with two patients about three weeks ago and now the patient strength has gone up to 20. With the staff of non-government aided colleges across Punjab and Chandigarh observing a 72-hour bandh, work in seven city colleges remained paralysed. All colleges held a protest at DAV College. The UT education department has declared holiday in all government schools in the city on Friday. The schools will remain closed on account of preparation of polling booths for the municipal corporation elections. However, examinations will be held as per schedule. Sumita Mukerjee, a resident of West Bengal, committed suicide at her residence in Ambala Cantt. Deputy Commissioner Shekhar Vidyarthi today held a meeting with representatives of various banks and development agencies at Panchayat Bhawan here. A local court today awarded life imprisonment to a Colony No. 5 resident for killing his neighbour. The case dates back to March. The District Consumer Disputes Redressal Forum-I slapped a fine of Rs 25,000 on Go Airlines for its failure to provide connecting flight from Mumbai to Nagpur to an official of the Punjab Mandi Board. The Mohali Consumer Disputes Redressal Forum has come to the rescue of a Chandigarh resident, Raghbir Singh, by directing the ICICI Bank to return the service charges levied on him by the bank. Seven-year-old Ishan was killed while his father and sister received injuries as the Maruti car they were travelling in fell into a deep gorge at Jallah village on the Morni road this morning. A beheaded body of a youth was found in the dense forest of Kaziyana village, Pinjore, here this morning. 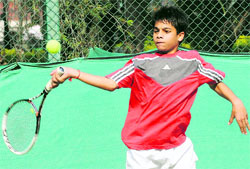 Karandeep Singh of Punjab defeated Santbir Singh to move into the final of boys’ (u-16) category of the St Stephen’s School CLTA-AITA Talent Series Tennis Tournament at CLTA courts, here today. A brilliant hat-trick by ace bowler Varun Khullar put Punjab team in the driver’s seat against West Bengal during a match of the Col CK Nayudu Trophy for boys (u-22) at the PCA, Mohali, today. Golfer Ravi Verma was adjudged the gross winner during the one-day golf festival organised by the Haryana Golf Association at Panchkula Golf Club here today. 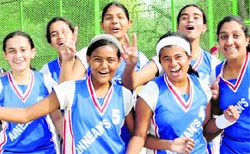 The teams of NPS, Sector 18, and St Anne’s School won the boys and girls’ titles, respectively, in the St Kabir Basketball Tournament here today.